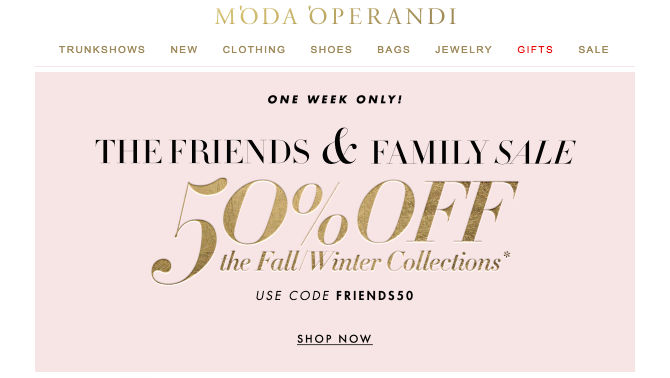 Earlier this week, I received, straight to my inbox, electronic enticement in the form of the following email, announcing 50% reductions on the 2017 fall/winter collections from Moda Operandi. You can be sure I clicked (who could resist such temptation?!) but as I was browsing through it occurred to me how pointedly this email speaks to our cultural obsession with newness. Think about it: clothing designed to be worn in Autumn/Winter 2017 is deemed half as valuable while we're still in the middle of Autumn, thinking of dressing for winter, although technically what's new is for spring. It's a fashion time warp that dictates a philosophy of out with the new, in with the newer. The value we place of newness, the desirability of the new, has become an inextricable part of our modern relationship with fashion. I get it, and I feel it. Novelty has a charge of its own, an attraction, an excitement. A new dress can be a quick way to try a different identity, to experiment with another layer of who we are, or to take a small step towards who we want to be. But the allure of newness for the sake of newness, which is increasingly pervasive throughout so many facets of our society, presents real challenges. Holding for the moment aside the sustainability of a fashion industry that produces such a volume of new clothes at such a speed, two things come to mind. First, newness can dilute our understanding of what actually constitutes value. We fall susceptible to conflating newness and value; to assigning new things a value based solely on their newness- but are newer things really more valuable as a rule? Second, the constant stimulus associated with living in a world where everything is new, this churn, which often has the patina of freshness and dynamism and vibrancy, I think might end up having the opposite effect- it hollows us out, and makes us feel disconnected. It's like the fashion equivalent of a sugar rush- temporarily satisfying, but not fulfilling. What feels novel to me is not valuing newness for its sake, but instead defining the set of parameters that constitutes real value to each of us personally. That might be newness, or alternately age, it might be to value our clothing based on the way it makes us feel, or the joy it gives us, or how special it seems. Determining real value is hard, and deeply subjective. Whatever the case, I suspect if we find what we value, it's unlikely that a few months into its life, we'll get to a place where it's half as valuable to us. It's been my own experience that with time, what is valuable to me only becomes more so. Feature image courtesy of the Elissa Ricci Fund at the Civic Library of Turin.